Welcome to our guide to the Frug. The Frenchie Pug is a designer breed developed by crossing the Pug and French Bulldog and is also known as a Frug. 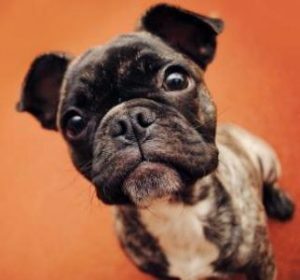 The DogExperts.info website aims to ask questions to breeders, vets and experienced owners to get the answers to your most frequently asked questions about the Frug breed of dog. We would love to feature your dog and publish any photos or pictures of your Frug you would like to email us. Are you looking to buy a Frenchie Pug – then see our list of Frug breeders. Frenchies and Pugs are two breeds with enormous personality. Put them together and the adorable behavior is doubled. What type of owners buy a Frenchie Pug? Frug owners range across many types of people. Frugs are great with all ages, from babies to elderly. They do well in situations from apartments to acerages. Being small they don’t need as much room as large breeds, but love the outdoors and exploring. Are you glad you chose to buy a Frug and not another breed? Our family have been Pug lovers and owners for 30 years. Pugs are not only adorable but have great personality. A few years ago when Frenchies began to gain media popularity their cuteness and personality seemed to be equal to that of Pugs. However we were nervous about the health problems they endure. Then a family local to us had a litter of two Frugs and we were in love at first sight of a photo. We feel that mixing the genes keeps Frugs from having the health problems of either breed but gives you the love and personality of both. How would you describe the Frenchie Pug temperment? All Frugs are not the same. Ours is very protective and doesn’t like strangers getting close to our daughter. However, she’s not aggressive, only vocal. She’s playful, loving, and cuddly. She likes to nap, yet loves to chase squirrels and play fetch. She’s calm and usually quiet but gets excited to go on trips or out to play. Are there downsides of owning a Frug that prospective owners should be aware of? Frugs tend to have some of the stubbornness of Frenchies, so they can be difficult to train. And as typical with both Frenchies and Pugs, Frugs are very susceptible to weather extremes. They don’t do well in extreme heat and should be kept indoors with air conditioning. As well as heat, they do not do well in extreme cold, so it’s goo that they look adorable in little sweaters. 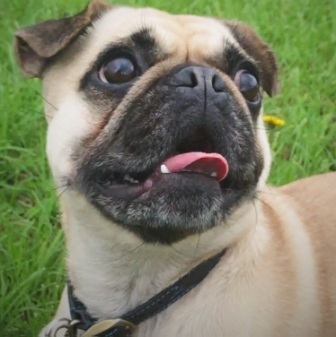 Is the Frug breed suitable for a person or family that are out at work all day? Our Frug does just fine home alone (as long as she doesn’t have access to a box of tissues… some how she feels they are the enemy and must be destroyed). However be prepared for extreme excitement when you return so make sure you’re able to give some attention. How is the Frenchie Pug with children? Our Frug is wonderful with kids. She adores babies and tolerates ear and tail pulling with no issues. She plays well with children of all ages and cuddles when play time is over. She is, however, very intuitive to whether children are animal friendly or not. How does the Frug get along with other pets? We already had an adult male cat when we brought our Frug home. She has had no issues with him. He gets upset with her sometime and she just walks away. Other times they play together. She is also good with other family members dogs and she plays, sleeps and shares her food. Why Choose a Frenchie Pug (Frug)? What in your opinion are the best things about the Frug breed? Why do you think the Frug is special? What are your favourite things about the Frug? What advice might you give to people thinking about whether they should buy a Frug over other breeds? What are the history and origins of the Frug? What colors of Frug are most popular? What does the Frug look like? What are the pros/cons of the Frug breed? What can a new owner expect in terms of differences between the Frug and other breeds? What type of typical personality does the Frug have? Is it possible to describe a fairly typical Frug? What is the breed standard/description for the Frug? Is the Frug breed of dog suitable for first-time dog owners? Some breeds can be described as greedy and prone to weight issues, would this apply to the Frug? Some owners seek a breed suitable for barking and offering a guard dog role – how does the Frug match up to that role? 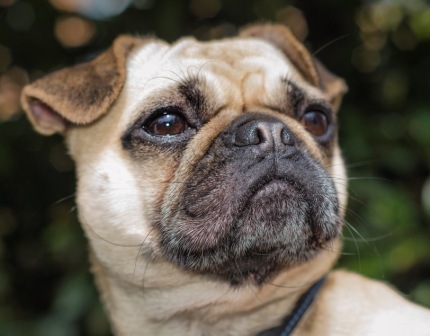 Are there myths about the Frug – in other words do new potential owners come to you with misconceptions about this breed? What types of questions do you get once owners get their Frug home? What is the typical temperament of a Frug, so people know what to expect from their new pet? When fully grown how much on average does a Frug weigh? When the Frug is full grown in size what is the maximum height and length expected to be? 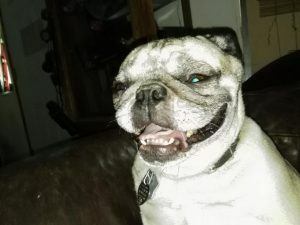 Is the Frug ever crossed or mixed with other breeds of dog? Does the Frug smell or drool a lot? Do you have a Frug growth chart? 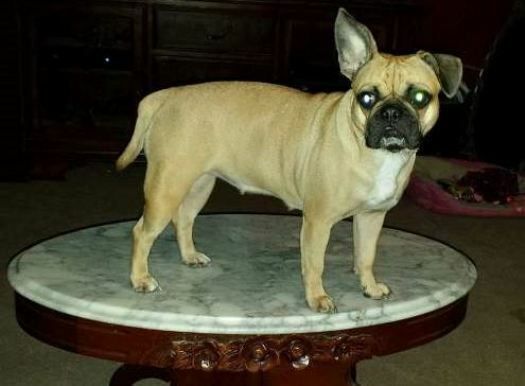 What breed group does the Frug come under? Are there some types of people that you can suggest the Frug is not suitable for, perhaps families? Do you think the Frug is suitable for families with young children? Is it better to buy one Frug or two? Would the Frenchie Pug be suitable as a guard dog? Can I leave my Frug during the day while I go to work? What is the expected average lifespan of the Frug? In terms of life expectancy, how long on average would the Frug breed live to? How to handle the Frug puppy to start off – how much food, what type, how often? Do owners need to consider supplements for their Frug? Buying – How Much Do Frenchie Pugs Cost? How much did your Frug cost to buy? Can you offer advice to people looking to buy a Frug and how much should they spend? What advice would you offer new Frug owners? What types of people are buying the Frug and why? Where can I buy Frug rescue dogs or find a Frug for adoption? Please note that buying or searching for a ‘cheap’ Frug can be false economy as they may have health issues that cost you far more in the long-term – always buy from a good and responsible breeder! How much do Frug puppies for sale cost on average? 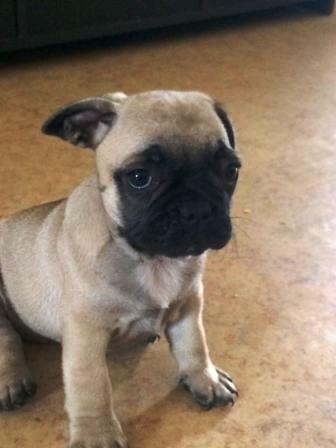 How would you describe the Frug puppy to potential new owners? What types of owners are best suited to owning a Frug? What inspired you to become a breeder and did you start with the Frug? As a Frug breed expert, are there any ‘essential’ tips you would like to share with new owners? How long does it take to housetrain/potty train a Frug? We invite you to email us your Frug’s pictures, in particular we are looking for photos showing Frug puppies at 1, 2, 3, 4, 5, 6, 7, 8, 9, 10, 11 and 12 weeks old as well as early pictures such as 1, 2, 3, 4, 5, 6, 7, 8, 9, 10 and 11 months old to a year old. Do they have any nicknames or does the Frenchie Pug have popular names? If my Frug is pregnant what might the litter size be? Could the Frug be dangerous around young children? How do you prevent a Frug biting? How do you prevent a Frug chewing? How do you stop a Frug jumping up? Does the Frug have an issue with excessive digging? Why does my Frug keep growling and barking? 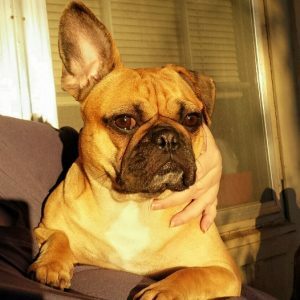 Is there a reason my Frug dog is often scratching excessively? 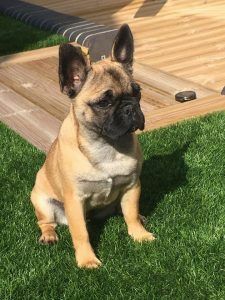 In comparison perhaps to other breeds what can you say about the Frug and their exercise needs and do you have any tips or advice for new Frug owners? As a breeder of the Frug, do you prefer a collar or harness? As an expert of the Frug breed do you prefer a standard leash or retractable? 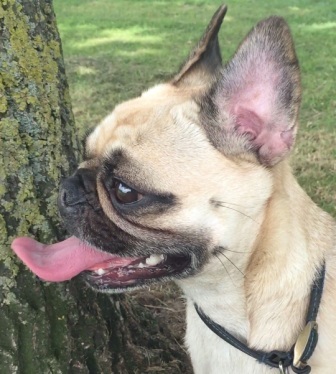 Can you offer any dog walking tips for Frug owners? What games and toys can you recommend for the Frug? How intelligent is the Frug compared to other dog breeds? What accessories are required to be purchased for grooming a Frug? How much do Frug shed and how do I maintain their hair and how often? Is the Frug a hypoallergenic breed? Any advice/tips you can give concerning cleaning and bathing your Frug? Can you offer new Frug owners advice concerning fleas and maybe products you use in treatment and prevention? What advice and tips could you offer to owners who might wish to follow your path in showing the Frug? What started your interest in showing the Frug? If a new owner perhaps wanted to meet other owners or find out more – perhaps they have an interest in joining a local club or maybe they wonder how they can start showing their Frug – where would they begin? How would an owner know they have a show-quality Frug and how would they start off? What inspired you to become a breeder and did you start with Frugs? What official organisations are there for the new Frug owner and what benefits or services do they provide? In buying a Frug, can you offer advice and tips to new owners? How did you progress to becoming a breeder and why focus on breeding the Frug out of all the breeds you could have chosen? What do you think makes the Frug special to you? In comparison perhaps to other breeds what is it like to train a Frug and do you have any tips or advice for new Frug owners? 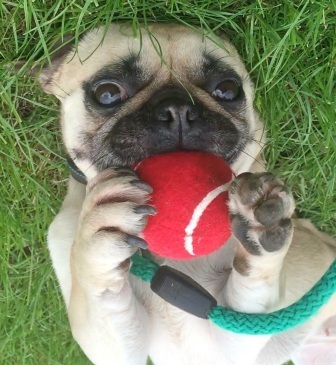 How should new owners approach bringing a new Frug home, any advice and tips you can give? Should I allow my Frug to sleep in my bed or elsewhere in the house? 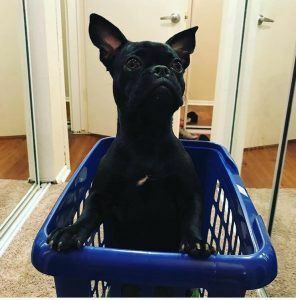 Should my Frug sleep in a kennel or crate? Health is always a major concern when buying a dog, do you have any advice for new Frug owners to be aware of in particular? What is the recommended schedule for vaccinations for your Frug? What type of health issues can a Frug have and how do you deal with preventing these? 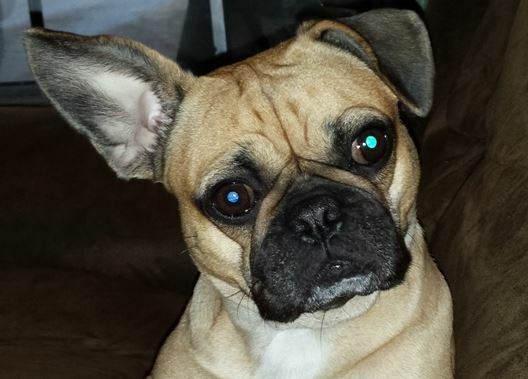 Why does my Frug have diarrhea? Why is my Frug vomiting and do I go to the vets? 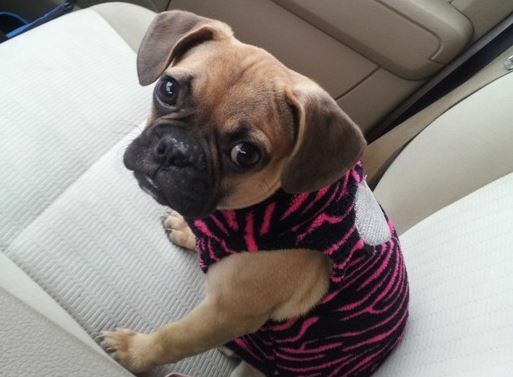 When should I take my Frug for vaccinations and which ones do they need and how often? 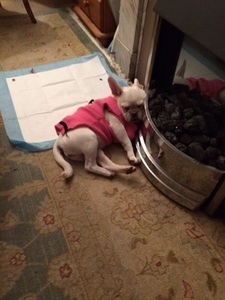 How often will my Frenchie Pug be in heat? 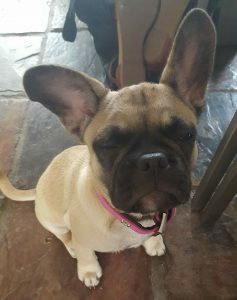 Should I consider getting my Frug spayed or neutered and when and how much does this cost and what are the benefits? My Frug is limping, what should I do and should I go to a veterinarian surgeon? Why is my Frug not eating? How much does it cost to insure my Frug? What healthcare issues or diseases might be excluded from companies that provide Frug dog health insurance? What age would you class as an ‘older or senior’ Frenchie Pug? What changes in food and diet would you suggest making for an older Frug? Do you feed any supplements to an older Frug – or anything else which helps them as they age? Are there any health issues particular to a senior Frug dog? Do you have any advice for owners of an older/senior Frug or tips you can pass on? Here is a really nice video showing a number of cute Frug puppies! We have a 7month old frug, his name is bob and he has an obsession with chasing his tail. He never gets tired he just goes round and round he pauses while he weighs his tail up then pounces on it often getting it and biting it but this doesn’t phase his he just does it again and he repeats for hours. Hes other toys to play with but always goes back to his tail after minutes. Why does he do it and how can we stop it?